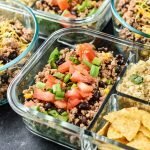 Hot & Cold Turkey Taco Meal Prep is made of two taco salads and two taco bowls so you can prep two kinds of lunches with half as much work! Best for those who despise eating the same lunch four days in a row! Use your preferred method to cook plain quinoa using low-sodium chicken broth as the liquid. Here’s some detailed information on How to Cook Quinoa in the Instant Pot, and How to Cook Quinoa in the Rice Cooker. Heat oil over medium heat in a deep skillet or Dutch oven. When hot, add ground turkey. Use a spoon or spatula to break the meat into smaller pieces. Add about 1/4 teaspoon of salt, and cook for 6-7 minutes, stirring occasionally. If you have a lot of extra liquid, you can remove the excess from the pan, but it’s not usually necessary with lean ground turkey. Add cumin, paprika, onion powder, garlic, jalapeño, black beans, corn, and additional 1/4 teaspoon salt. Stir until mixed. Simmer on the stove for another 2-3 minutes and then remove from heat and cool. Divide your cooked and cooled quinoa into two bowls, placing half in each (about 1 1/2 cups each). In one half, add lime juice, cilantro and salt. In the other, add cumin, chili powder, and tomatoes with green chilis. Stir each bowl of quinoa and set aside. Assemble your meals: Add lettuce to the salad containers, and tomato quinoa to the taco bowls. Divide the taco meat evenly between all four meals. Add lime cilantro quinoa to the salads, along with any raw vegetable toppings like green onion and tomatoes. Add cheese and cilantro (or anything you don’t mind being reheated in the microwave) to the taco bowls. Avocado should be added when consuming so it doesn’t brown in storage! Store in sealed containers for up to 4 days. The taco salads are great straight from the fridge, and the taco bowls are perfectly reheated after 1 minute 45 seconds in the microwave along with some stirring. Nutrition information estimated with My Fitness Pal and does not include chips or avocado. Recipe modified from my original Meal Prep Turkey Taco Black Bean Salads.